Vanaf 1 november tot de voorjaarsvakantie in februari ook op maandag gesloten. From November 1st up to Spring break also closed on Mondays! Nothing is more relaxing and beneficial for body and mind than yoga except maybe yoga on the Goatfarm in the middle of the Amsterdamse Bos, surrounded by nature. Just by entering the quiet woodland in the early morning, you already improved your state of mind. When you arrive at the Goatfarm Ridammerhoeve and the animals greet you, it’s clear that you’ve achieved all that you need to achieve today. This is a mini retreat just outside of the city! Every Saturday and Sunday we complete a yoga practice in the company of goats right in the middle of the their barn. Just being around these sociable animals causes, the body to produce the cuddle hormone oxytocin, relaxing the body and mind and therefore assisting you in your postures. 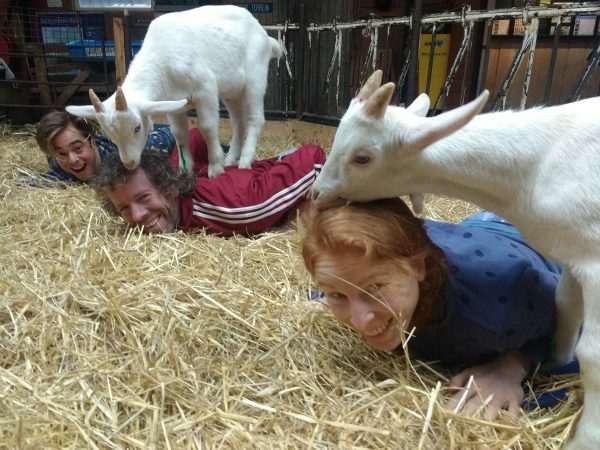 It is also possible to come and experience the goat yoga class with a group (min. 10 people). Afterwards we will serve you a breakfast or lunch with fresh products from the farm. Yoga classes are taught by Brenda Bood of Yogalesje.nl.